If you have ever seen the Will Farrell movie Semi-Pro, you have witnessed a funny loose-leaf version of how the ABA and the NBA merger was created. Wills story is ficticious and funny but a close depiction of what the ABA/NBA Merger was about. Unlike the NBA the American Basketball Association is a membership league. Teams owners pay for market reservation to play in a particular area of the U.S. approved by the league. Teams are expected to find a way to create budgets and fund their own programs, and abide by the guidelines of the American Basketball Association (ABA). That also means teams rely heavily on community support and creative ways to develop long term partnerships with potential partners. But that also means we don't have to charge astronomical prices to come enjoy professional basketball, that rivals the NBA's D league and some NBA teams. The ABA enjoyed its first level of television success with a host of over 20 games on ESPN last season. The normal full schedule for ABA teams is 30 games per season. 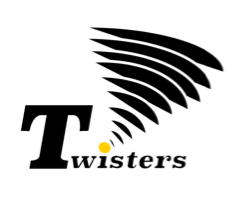 The Tulsa Twisters are a part of the the Great Plains Conference, which consists of 6 teams. One of the main twists to the Twisters Organization is that we are making a concertive effort to bridge the gap between professional sports and the underserved communites. The 2015/16 Tulsa Twisters debuted with 7 documented Native Americans on the team. 1. While playing against the #1 Team in our Conference the Laredo Swarm (1/9/16) the Twisters Player of the Game was John Tarbell with 22 points. Mr. Tarbell is Native American. 2. We have 2 female coaches. Patrice Marshall and Native American Lila Osceola-Heard. 3. Did you know the ABA was responsible for the introduction of the Slam Dunk? 4. Did you know the ABA was responsible for the introduction of the 3 point Field Goal? Well we have several unique rules in the ABA, here are a couple. When a team loses possession of the ball (violation or foul), before PLAYER Control is established in the frontcourt, the 3D RULE IS "ON." This, of course, also includes any turnover, resulting from a pass from the backcourt. •A 2-Point Field Goal Shall Have A Value Of THREE Points. •A 3-Point Field Goal Shall Have A Value Of FOUR Points. •A 4-Point Field Goal Shall Have A Value Of FIVE Points. Each Team Is Allowed To Have Up To 12 Team Members In Uniform. The Home Team Is Allowed ONE CELEBRITY Team Member, who is also eligible to play. The CELEBRITY Team Member Must Be IDENTIFIED And NOTED In The Scorebook. The CELEBRITY Rule Only Applies To The Home Team. We think you are going to enjoy the ABA's brand of basketball. The Twisters feel in order to make real change you have to be able to relate to the individuals that you are seeking to change. Diversity is a major part of what we are building in Tulsa, Oklahoma. We believe our programs and partners can help find solutions to problems like, anti-bullying, Reading Programs, Sports fitness, and honing basketball skills. We feel over time, we can help to turn young minds to other varying interest. Our players believe in giving back. They spend countless hours working in the community serving the underserved, without as much as a photo in the news to showcase all that they do. Well, we want to change that and show that when people come together for the right purpose, anything is possible.